Building a new house is an exciting experience for you and your family, but you need to consider your yard and landscaping as well. You can transform that uninviting patch of dirt into an amazing outdoor space that your family will enjoy for years to come. Now is a good time to let your imagination run wild since you are starting from scratch. Consider your current and future needs, and if you will need professional help; it’s available at every step. When determining the size of your lawn, think about how much open space you’d like to have before crowding yourself out with flowers, trees and shrubs. It would be unfortunate not to have a nice level space for playing washers or catch, or to place a swing set for the kids. The lawn itself, whether sodded or seeded, will need daily watering until it’s established. Whatever watering system you use, consider buying a rain gauge to ensure you lawn receives the necessary amount of water to grow and thrive. Shrubs or hedges can be used to create boundaries as can flower beds. Until those well-placed trees mature and create their shady canopy, explore other options for shade like a trellis, arbor or pergola. 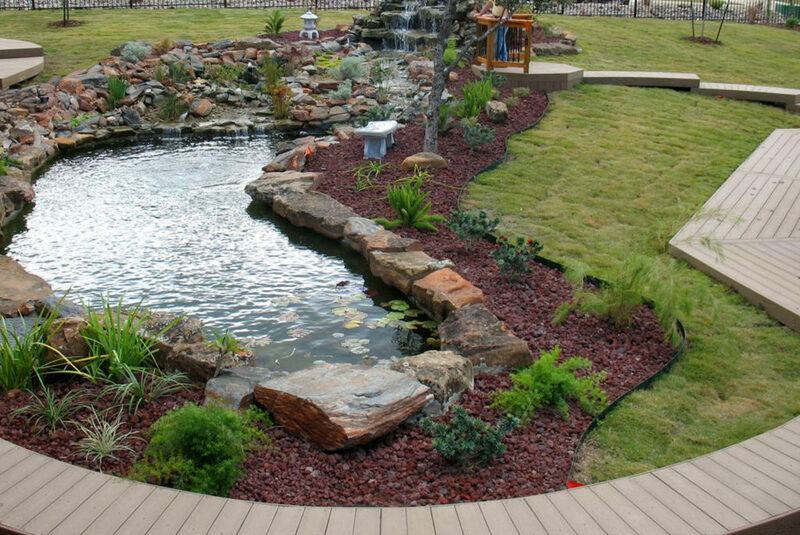 This would also be a good time to add visual features like koi ponds, waterfalls or fountains. Most likely, you will already have underground pipes and lines marked so you won’t hit something when digging. If you want to had hardscapes to your yard, take some time to consider concrete benches, stepping stones, and statues. With that open dirt lot, placing items that may need foundations or leveling will be a lot easier than digging up an established lawn. Although it may seem like a huge task, a little preplanning will hopefully curb those “coulda, woulda, shoulda“ moments that come later. Even if they do, by then you will be a seasoned homeowner, an amateur landscaper and master gardener and you will know how to deal with it.